As we brace ourselves for a scary ice storm here in southern Mississippi, I find myself trying to squeeze in as much time as I can online! Because that’s what’s important, right? Avoiding internet withdrawal in the face of an extended power outage?? But seriously, this type of weather is so rare down here and our homes and power/water lines aren’t designed to deal with this sort of thing, so we are expecting things to be rough for a few days. In fact, the electric companies are already sending out automated messages and texts warning customers that we might not have power for 3-5 days starting tomorrow… very scary for us warm-weather folks (who can often wear t-shirts and shorts on Christmas day or New Years). That aside, let me tell you about this cake! 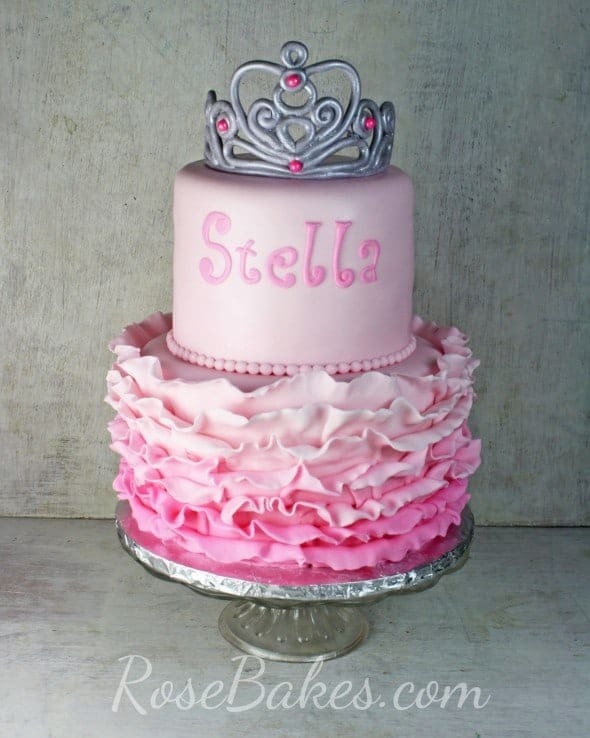 I’ve done princess cakes and ruffles cakes before – so there was nothing really “new” about this cake – but I was still totally in love with it when it was finished! … here’s a close up of the pearl border. 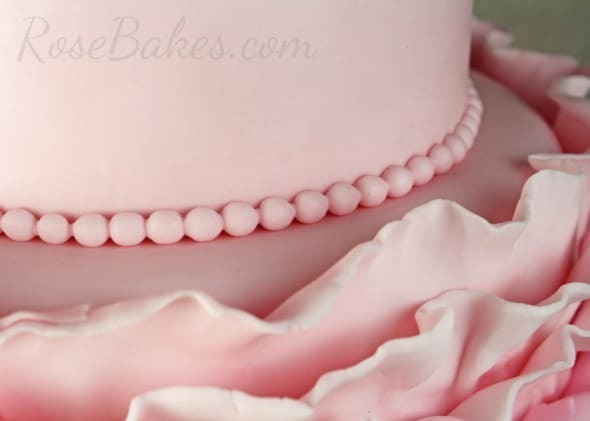 I used a silicone pearl mold to make the pearls. Funny thing… a couple of weeks ago my brother was hanging out here while I worked on cake orders. I was telling him that I didn’t want to really put pearls on that particular cake because I thought it didn’t need them. Ha! I told him… “Work smarter, not harder!” Pearl molds are not cheap, but they’ve saved me so much time over the past couple of years – I cannot imagine not using them! For the name on the cake, I used my trusty and favorite Funky Alphabet Cutters. 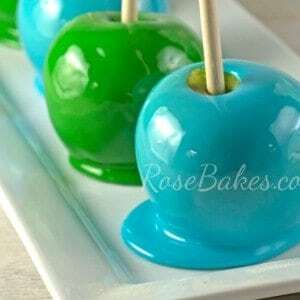 I get so many questions about how to use these – I really need to do that tutorial next! 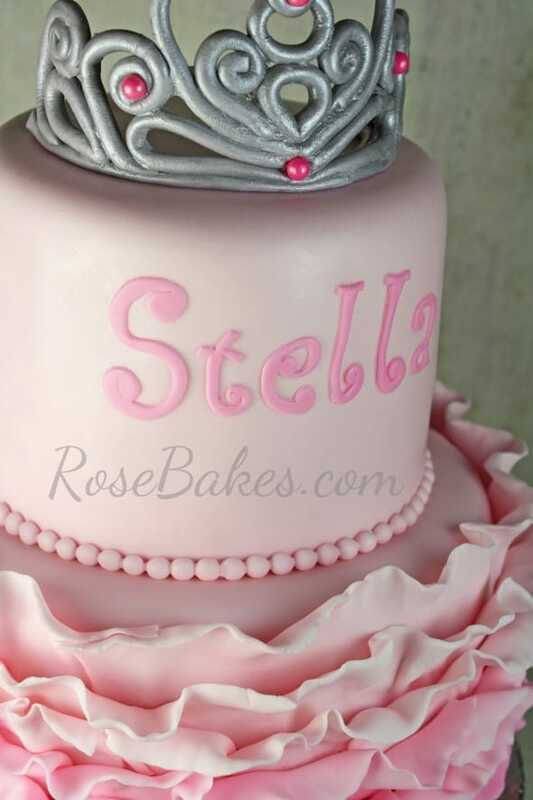 And last but not least – the gum paste tiara cake topper. 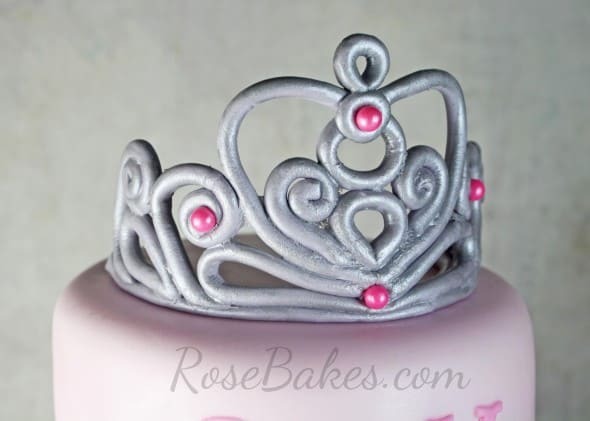 You will find my how to make a gum paste tiara tutorial here. 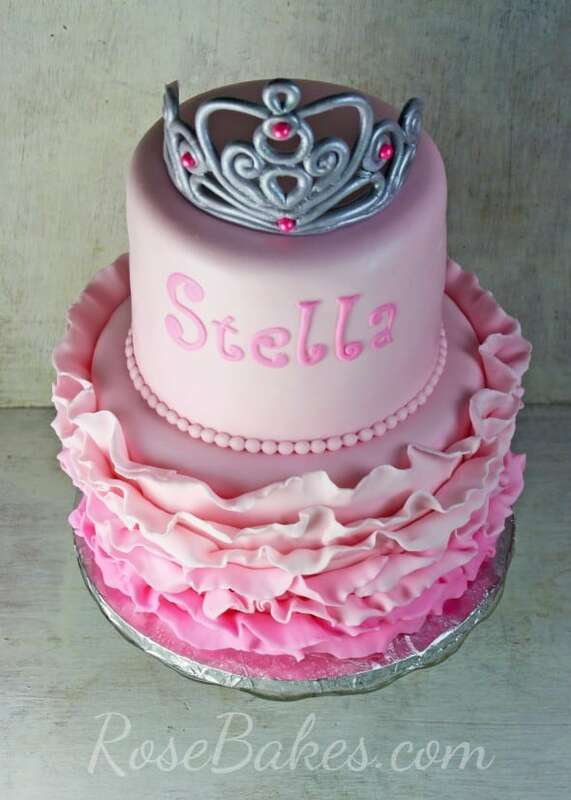 I added bright pink sugar pearls on this one and it was a slightly different pattern from my ‘usual’ tiara. This cake was 6″ and 8″ round vanilla cakes. 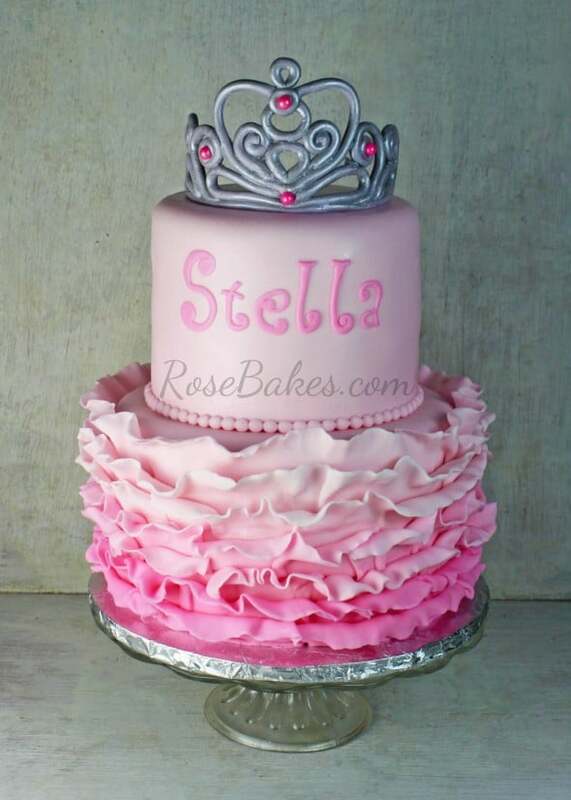 I used homemade marshmallow fondant for all of the decorations except the tiara – it was gum paste. That was a fun (and very busy!!) weekend! 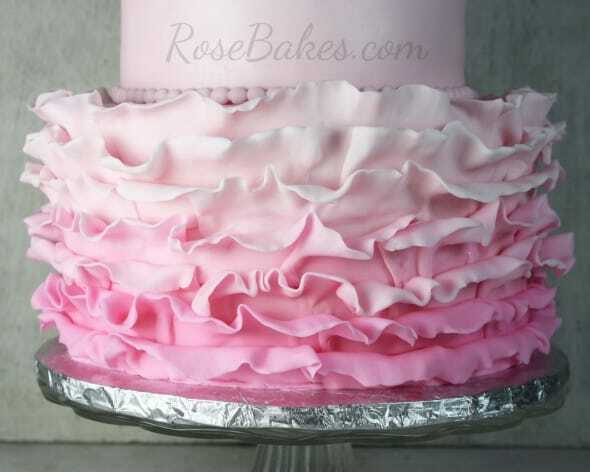 Do you have any questions about the Ombre Ruffles Princess Tiara Cake? Leave a comment! Hi Rose! 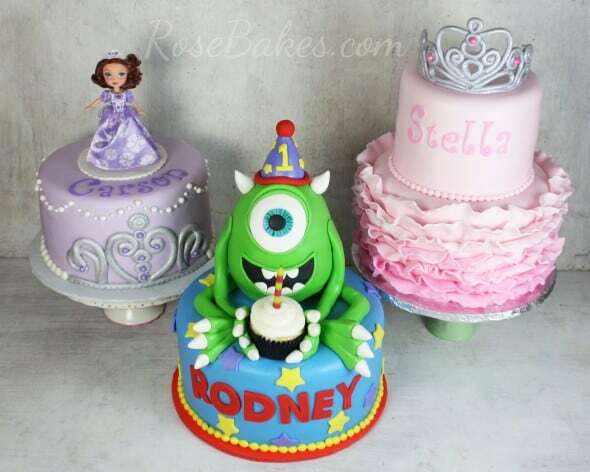 First let me say that your cakes are amazing! I love looking at them for inspiration. I was wondering how you get the Funky Alphabet Cutters to work without sticking. I bought them recently, but I have a lot of trouble getting the letters out. Help! I plan to post a tutorial on that next week!